You *may* have heard that we are headed to Munich later this summer. The idea for the trip was actually about four and a half years ago, when the older boy was just getting started with his German I class. Having enjoyed the heck out of five years of German class (8th-12th grade) and having spent one month in Germany as a teenager, I knew that I wanted to get this kid over there, to reinforce what he was learning and to make it real. There’s something about traveling to a place whose language you’re learning that solidifies so much in your mind. Now, don’t go thinking that this trip was the sole motivator for his completing all four years. At the end of his second year, he really wanted to stop, and I told him it was his choice. Some friends of his were moving on and talked him into one more year. When German 3 began in his junior year, he had a revelation and was a little irritated. The three of us will sometimes chat (around the house) in very rudimentary German. The older boy has the best sentence structure; I am very rusty but can understand lots. The younger boy knows the basics. Our conversations are hilarious. There’s one person who has no idea what we’re talking about, though. 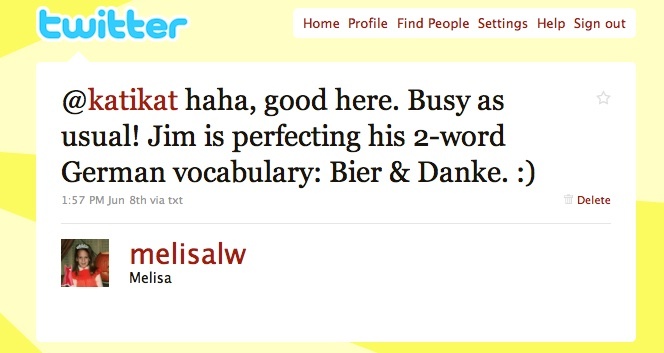 Jim does not speak German. He took French I in high school, and I’m pretty sure that he won’t mind that I tell you about how he did very, very poorly in the class. Very. That’s okay though, because even though foreign language is not a strength of his, he more than makes up for it in other areas. 1. Most people in Munich speak English. 2. Our awesome hosts, Kat and her hubby, speak English. 3. The boys and I can handle any German that comes our way, if need be. He’s trying, though. He’s got a couple of words, three to be exact, under his belt. 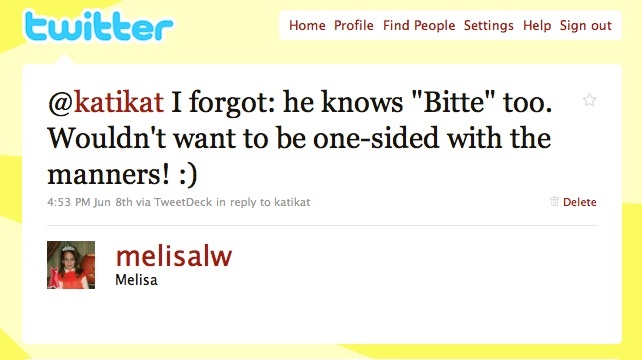 I had the opportunity to tell Kat about them the other day, when she asked me (on Twitter) how I was doing. I think we’re all going to be just fine. You are going to have such a great time on vacation! 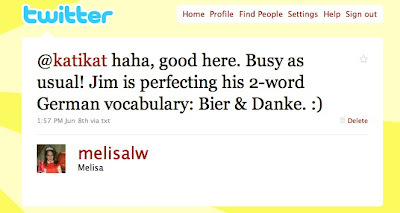 While you are here, you can polish up your German, we'll teach Jim some words and phrases and we will polish up our English. Fun, fun, fun. Sounds like a great time will be had by all. And thanks for the tip. I am planning to use your example as a carrot for my teen. She's in Spanish, so I have lots of destination choices! I am SO excited for you all-Kat included!! I can't wait to live through you. Very exciting! Nick and Scott can speak Spanish and they like to speak it in front of me (I don't speak any foreign language, unfortunately.) Nick took 4 years of Spanish in high school and tested into the 300 level in college! Did the older boy sign up for German at college? 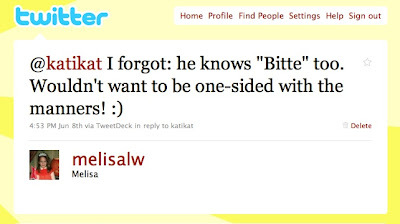 I took German in college and can only remember how to say 'I don't know' and 'I don't understand' – two phrases I used a lot in class. I loved the language and still wish I had stuck with it, and studied better. as you know, i took four years of german in highschool then went on to major in german in college. speaking a foreign language is a great skill and it also helps one gain command of one's native tongue. i hope you guys have a great time. it will truly be a wonderful trip! I'm envious – and I hope you have a ton of fun! Your boys are going to be great men, with the work ethic you've instilled in them. Other than bathroom, I can't think of any other word he would need! That trip sounds like so much fun. Sausage and Beer come to mind. You are right to encourage your boys to take as many years as possible of a foreign language. That is a great skill to have later in life. I took two years of French and still remember a lot of it. Of course French is useless. What does anyone need that for. France is not a serious world leader. Neither is Haiti or the Ivory Coast. Previous post: This is Why I’m Hot.